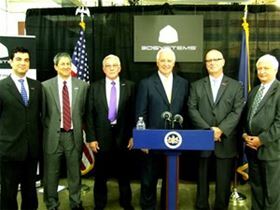 From left: Dr Ozdoganlar, Carnegie Mellon University, Dr Allen Snyder, Lehigh University, Jim Williams, 3D Systems, Gov Tom Corbett, Ralph Resnick, America Makes, Ed Morris, America Makes. The grants are provided by the Commonwealth of Pennsylvania and America Makes and will be used to finance research conducted in partnership with 3D Systems. Grants of US$1 million each were awarded to Carnegie Mellon University (CMU) and Lehigh University. Additional private industry in-kind contributions to a value of US$1 million are being provided to fund both projects. The announced grants will be used to fund at least 13 projects, including the fabrication of medical instrumentation for knee and hip replacement and complex additive manufacturing with various materials. 3D Systems will partner with Carnegie Mellon and Lehigh University to support these projects.